Chinese politics from the provinces: As He Turns 90, Is Jiang Zemin Still Interested In Making Waves? As He Turns 90, Is Jiang Zemin Still Interested In Making Waves? One of Jiangsu’s favorite sons--former Chinese president and Communist party chief Jiang Zemin--turned 90 years old today. Not that anyone here in Jiangsu would have necessarily known that. State news outlets in China (at least by early evening Wednesday local time) continued to stifle any official mention of Jiang’s birthday; it was left entirely to social media to note the date and comment—almost universally positively--on his tenure as China’s Communist party leader from 1989-2002. Local papers and media sites followed Beijing’s lead and stayed quiet. The lack of official recognition of Jiang’s birthday isn’t surprising, locally or nationally. Former leaders in China simply aren’t allowed to become political legends in their lifetimes. In China, it’s acceptable to note one’s political elders by honoring them in symbolic ways on national occasions or party anniversaries, and sometimes by low-profile visits when their health is poor. But Chinese leaders—national and local-- pay official tribute to their political predecessors only when the latter have actually slipped the mortal coil, not before. Moreover, celebrating Jiang’s 90th birthday would be extolling someone who elevated economics over ideology, growth over tighter governance. That’s precisely the opposite of what China’s current President Xi Jinping stands for. Xi sees Jiang as having presided over a China in which society began to drift from socialism and China’s Communist party devolved into a period of deep corruption. The symbolism of praising Jiang on his birthday would be too much for Xi and his allies to swallow. Then there’s the nostalgia factor. Some officials and intellectuals, as well as activists, see Jiang as having allowed a certain amount of civil space during this time, as well as encouraging social and political debate to take place—something that’s clearly missing from today’s China. Calling attention to Jiang’s tenure could embolden others to yearn for a return to the policies he purportedly espoused. So Xi's supporters have made it clear to some of the more outspoken bloggers that any attempt to hail Jiang will be viewed as a bid to harm Xi and question his agenda. 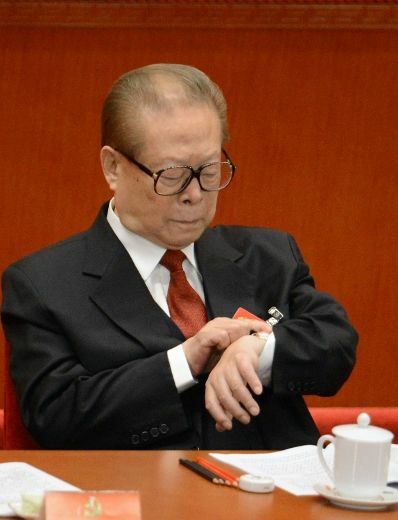 The only official recognition that anyone can apparently agree on publicly regarding Jiang Zemin’s 90th birthday is that, like other Chinese leaders, he still swims pretty well. In one of the very few recent references in Chinese state media to Jiang, an article entitled “Swimming Leaders” mentions that everyone who ruled modern China also tried to rule the waves. Mao Zedong took his famous float in the Yangtze River and made swimming suitable for poster art; Deng Xiaoping preferred the open ocean to paddling in pools; Hu Jintao likes table tennis but also enjoys the water; and Xi Jinping is said by the article to swim a kilometer a day. Then there’s Jiang Zemin, who insists that swimming keeps him “mentally young”. The article states that Jiang swam in Wuhan’s East Lake 600 meters or so daily when he was exiled there as a “capitalist roader” during the Cultural Revolution; took to the ocean in Hawaii for an hour during a trip to the United States in 1997; and floated in the Dead Sea in Israel three years later, “feeling great when he emerged”. The article cites an overseas edition of People’s Daily that claims that Jiang still swims 600 meters a day in his retirement. There’s heavy symbolism in this article, which surfaces nearly out of nowhere. After all, Mao’s famous float in the Yangtze signaled supporters that he was neither dead nor done in Chinese politics. This article is of much the same sort--though, in the present political environment, it had to be about all Chinese leaders to be acceptable to censors, and its low-profile placement indicates that it’s neither authoritative nor universally accepted in official circles. But its timing and focus clearly make the piece about Jiang Zemin, and it did get published at the every moment when he and his supporters were purportedly instructed to stay below the waterline. They didn’t, and that’s important. It’s not clear how much time Jiang and his ideas have left. But the article seems to be a further sign that Jiang continues to push against the prevailing political tides and is determined not to simply drift away. What no one yet knows is who will decide to swim along with him.